Sie können insgesamt bis zu 6 Reisende auswählen. 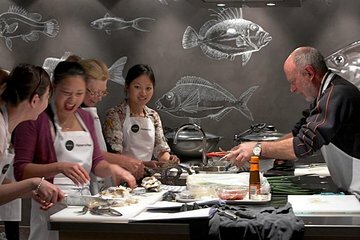 Wenn Sie Australien mit einer bleibenden Erinnerung und vielleicht einigen neuen Fähigkeiten verlassen möchten, versuchen Sie diesen Kochkurs, der von der Sydney Seafood School im Sydney Fish Market veranstaltet wird. Probieren Sie die lokalen Aromen und probieren Sie nach einer Vorführung Gerichte, die von frischen australischen Meeresfrüchten inspiriert sind. Genießen Sie inklusive Weinproben zu den Gerichten und nehmen Sie ein Rezeptheft und eine Andenkenschürze mit nach Hause. sIt was one of the most professipnal classe I ever took. In the beginning You get a run through what You are cooking, learn a bout ingredients and techniques. You gat a receipe booklet and can make Your own remarks. There is a demonstration of what to do and and why and then You aree assigned to cooking stations that are well prepared. There are Your ingredients, aprons, tools, appliances and You organize yourself as a group. We wre 4 and hat a lot of fun. The instructors 3 people came by and checked on You or helped, when needes. We fixed 3 tapas and the ingredients wer very fresh seafood, very good quality. We fixed a Paella and then You transfer to the dining room where the tables are set up for the groups according to their station. I have a few allerdy- issues and they catered to all of them. Just contact them in advance. It was plenty of great food, a bottle of wine on each table, water and tea/ coffee. Although the timeframe was 3 hours, nobody cared we stayed for 4 hrs. That class was a lot of fun, a wonderful experience and worth every penny!